Vancouver, BC - Skyharbour Resources Ltd. (TSX-V: SYH) (OTC Grey: SYHBF) (“Skyharbour”) is pleased to announce the completion of the 2013 summer field exploration program at the Preston Lake Property, resulting in the delineation of at least eight prospective exploration corridors. Final preparations for additional radon and ground geophysical surveys to refine drill targeting are underway. 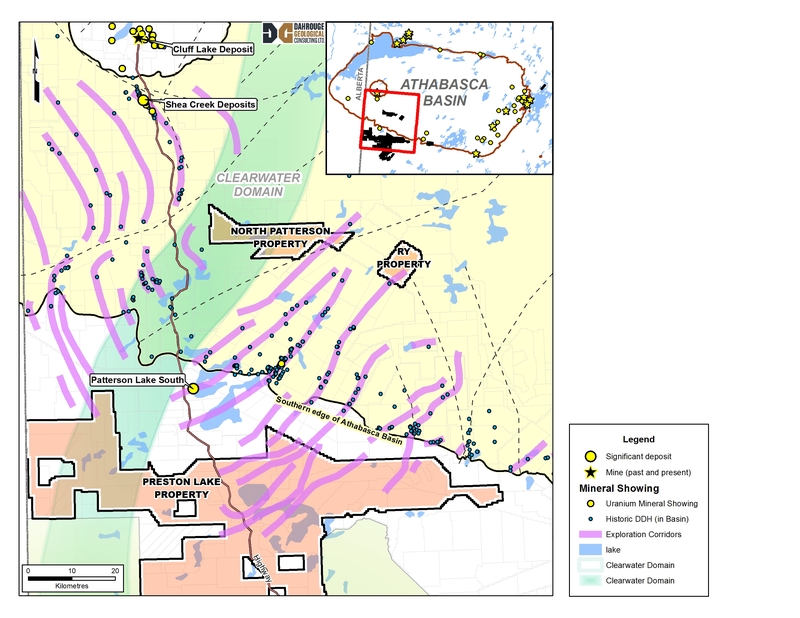 The 246,643 hectare Preston Lake Property (the “Property”) is the largest land package proximal to Alpha Minerals Inc. and Fission Uranium Corp.’s Patterson Lake South (“PLS”) high-grade uranium discovery. The Western Athabasca Syndicate (the “Syndicate”) holds title to the Property and consists of Athabasca Nuclear Corp. (TSX-V: ASC), Skyharbour Resources Ltd., (TSX-V: SYH), Noka Resources Inc. (TSX-V: NX), and Lucky Strike Resources Ltd. (TSX-V: LKY). 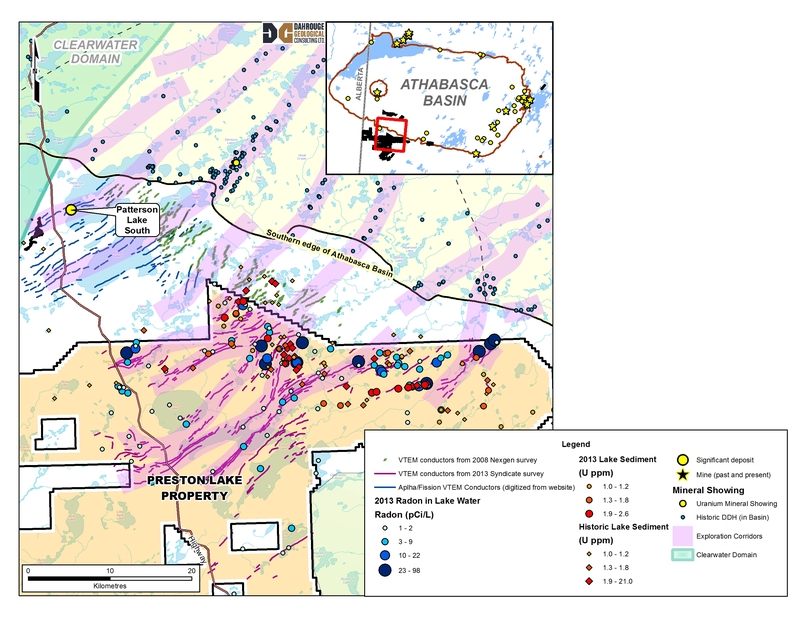 Fifteen drill target areas associated with eight highly prospective exploration corridors have been successfully delineated through extensive summer airborne geophysics and ground evaluation. Drill target areas to be refined with ground gravity, electromagnetic (EM), and radon surveys in Q4-2013 and Q1-2014. Permitting is underway with winter drilling anticipated to commence in March 2014. Final results from the recently completed Phase 3 of the summer program are still pending and will be reported when received. Given the size of the property, exploration to date has only focused on approximately half of the land package leaving significant exploration upside potential in untested areas. Thus far, integration of the geochemical data received with the airborne geophysics and historic data has successfully delineated more than fifteen high priority areas associated with eight highly prospective exploration corridors. The Property’s prospective corridors are very similar to the corridor hosting the high-grade PLS discovery by Alpha Minerals Inc. and Fission Uranium Corp. (see link below). Management cautions, mineralization present on proximal properties (or ‘corridors’) is not necessarily indicative of mineralization on the Syndicate’s Property. Skyharbour has entered into a Consulting Agreement (the "Agreement") with Vancouver based Transcend Resource Group (“Transcend”), who provides investor relations and related corporate communications services to public companies in Canada. Transcend will help raise investor awareness of Skyharbour by increasing its visibility in the financial marketplace, attracting investment to the Company, and expanding coverage within financial networks. The Agreement has an initial term of two months until December 31, 2013. In consideration for the provision of the services to be provided, Transcend will be paid $3,000 per month, plus applicable taxes by Skyharbour. The Agreement is subject to acceptance of the TSX Venture Exchange. Skyharbour Resources Ltd. is a uranium exploration company and a member of the Western Athabasca Syndicate which controls a large, geologically prospective land package consisting of five properties (287,130 hectares or 709,513 acres) in the Athabasca Basin of Saskatchewan. $6,000,000 in combined exploration expenditures over the next two years is planned on these properties, $5,000,000 of which is being funded by the three partner companies. Skyharbour also maintains a diverse portfolio of precious and base metal projects in the Red Lake district of Ontario. The Company is well funded with over $1 million in the treasury and has 43.6 million shares outstanding with insiders owning over 25% of the outstanding shares. Skyharbour’s goal is to increase shareholder value through new discoveries and developing exploration projects in geopolitically favourable jurisdictions.